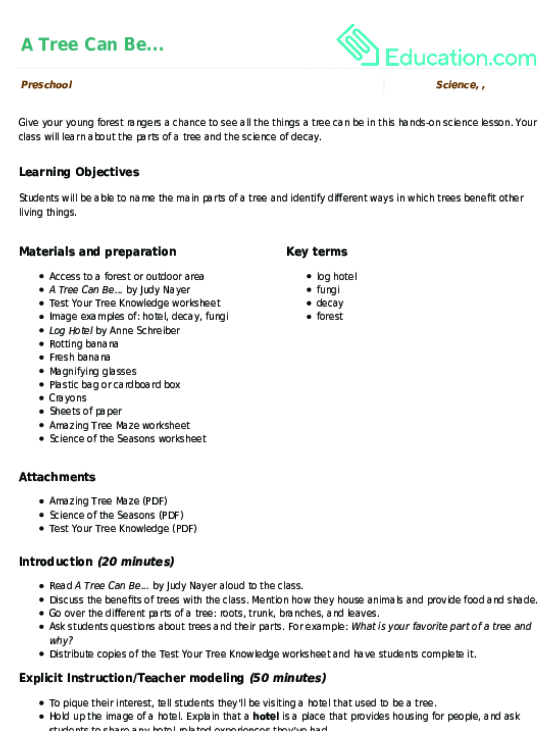 Students will be able to name the main parts of a tree and identify different ways in which trees benefit other living things. Read A Tree Can Be...By Judy Nayer aloud to the class. Discuss the benefits of trees with the class. Mention how they house animals and provide food and shade. 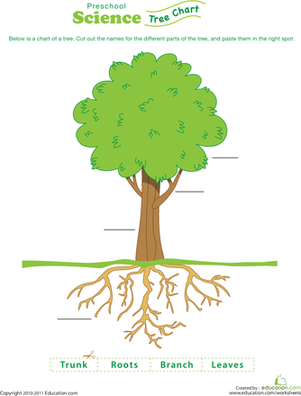 Go over the different parts of a tree: roots, trunk, branches, and leaves. 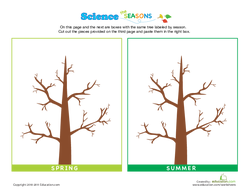 Ask students questions about trees and their parts. For example: What is your favorite part of a tree and why? 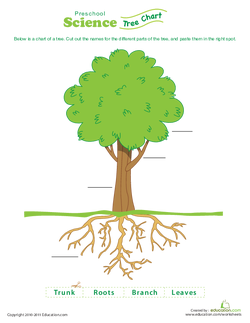 Distribute copies of the Test Your Tree Knowledge worksheet and have students complete it. To pique their interest, tell students they'll be visiting a hotel that used to be a tree. Hold up the image of a hotel. Explain that a HotelIs a place that provides housing for people, and ask students to share any hotel-related experiences they've had. Read Log HotelBy Anne Schreiber aloud to the class. During the story, introduce the words 'decay' and 'fungi' by showing the images for each. Explain that the Log hotelIn the story is an old tree that fell over, Decayed(spoiled), and became a hotel for insects, plants, and Fungi, or moldy bacteria. Show the class the rotting banana. Explain that the banana is decaying, just like the tree in the story. Hold the fresh banana next to the rotting banana, and ask students to compare the two. Some guiding questions you can ask are: Do they look the same? Do they feel the same? Which would you rather eat? Distribute a magnifying glass to each student, then begin the class trip into the forest. Explain to students that a ForestIs an area with lots of trees and other greenery. 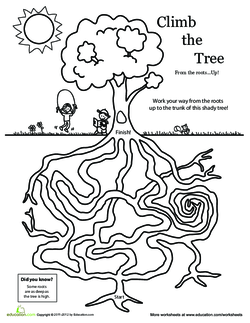 Select a tree to examine with the students. Have them touch its trunk, and ask them how it feels. Point out the parts of the tree that you went over prior to the trip. Find a log hotel. Point out aspects it shares with the log hotel in the story, like moss and fungi. Pull off a piece of the log. Have students inspect it using their magnifying glasses, and ask them to look for insects that have "checked in" to the hotel. Collect some parts of the decaying log in a plastic bag or cardboard box, and bring them back to the classroom for further examination. Once you've returned to the classroom, bring students together for a sing-along. You make me happy, with all your leaves. Jump in fallen leaves when I please. I love trees. I love trees. They grow apples. I love trees. I love trees. They give me paper. I love trees. I love trees. They give me shade. I love trees. I love trees. They help animals. Distribute crayons and sheets of paper to the class. Ask students to illustrate something they've learned about. 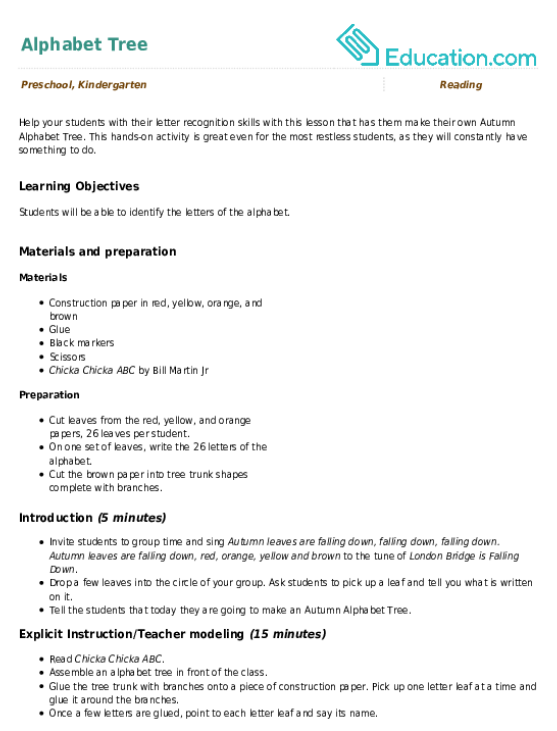 For example, they can draw parts of a tree, or a log hotel. As they work, ask each student to describe his illustration. Record their descriptions on your own sheet of paper. Allow students to use their magnifying glasses to further examine the decaying log parts on their own. Enrichment:Students in need of a greater challenge can be assigned the Amazing Tree Maze or Science of the Seasons worksheet. Support:Struggling students can be given simpler prompts for the drawing activity. For example, a student who has trouble drawing a log hotel can be asked to draw moss and fungi instead. To assess students' comprehension over the course of the lesson, pay close attention to their responses to your questions. Use your class list to record comments about the illustrations that students choose to make. Ask students to share what they liked most about the lesson. Discuss the pictures that they drew. Some great questions to ask during the discussion are: Why did you choose to draw this? Did looking through your magnifying glass help you find more things to draw? 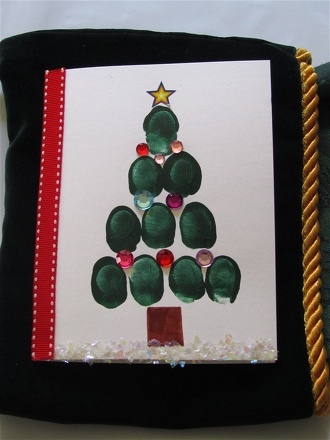 Your little kindergarten elf will develop some important fine motor skills while creating an entertaining game: Pin the Star on the Christmas Tree!